Directorate of Forensic Science Laboratories Maharashtra Officials are now in hiring mode. So, for this purpose, they circulated DFSL Maharashtra Recruitment 2018-2019 Notification. This advertisement is for the 140 Scientific Assistant Group C, Senior Laboratory Assistant, Senior Clerk, Junior Laboratory Assistant, Clerk Typist, Driver, Laboratory Attendant, Peon, Telephone Operator Vacancies. So, all the Unemployed people from the Maharashtra State should immediately check the requirements. And can proceed to apply before the final date. Now, the officials of the DFSL Maharashtra are expecting the applications for the available vacancies from the contenders in the prescribed manner. Then only they will consider your application form. If not your application form is rejected. Now, coming to the important dates, you should remember while applying are the starting date to apply and the closing date to submit the application form. According to the DFSL Maharashtra Recruitment 2018-2019 Notification 12th April 2018, is the deadline. As soon as the DFSL Maharashtra Recruitment 2018-2019 Notification is out. Many people tried to get the details. But many of them are unsuccessful in holding the proper information. So, make this easier for the people, we are writing this post. And it contains all the information about the DFSL Maharashtra Recruitment 2018-2019 Notification. So, all the people can proceed and check this article, until the end if they want to find out the information. So, all the applicants have to remember that they need to have correct qualifications as of on time of applying. Apparently, the officials of the Directorate of Forensic Science Laboratories Maharashtra are going to accept the application forms for the DFSL Maharashtra Recruitment 2018-2019 Notification only if they are submitting the online format. So, keep that in mind while applying. More details are arranged in next sections of this post. Please check the above table. And it consists of all the information that you are looking in DFSL Maharashtra Recruitment 2018-2019 Notification. So, accordingly, to the information given in the official advertisement, all the applicants must and should have the correct Educational Qualification. Now, basing on the sources, we got in the advertisement, those people applying for the DFSL Maharashtra Recruitment 2018-2019, have to complete their 10th Class or B.Sc or Any Bachelors Degree in relevant Specialization from any recognized institute or University in India as the Educational Qualification. Only the applicants who are having the above-stated as the educational Qualification are accepted. Otherwise, your application forms for the DFSL Maharashtra Recruitment 2018-2019 Notification is rejected. Are you looking for the Government Jobs in Maharashtra State? then this DFSL Maharashtra Recruitment 2018-2019 Notification is surely a good news for all such people. Therefore, all such aspirants are requested to check this post, to get the information, you are searching for. Now, according to the data in the DFSL Maharashtra Recruitment 2018-2019 Notification, all the people need to have correct age along with the Educational Qualification. According to the info circulated through the DFSL Maharashtra Recruitment 2018-2019 Notification, applications with the minimum age of 18 years are acceptable. Also, the maximum age of 38 years is even accepted. So, keep this in mind and proceed. 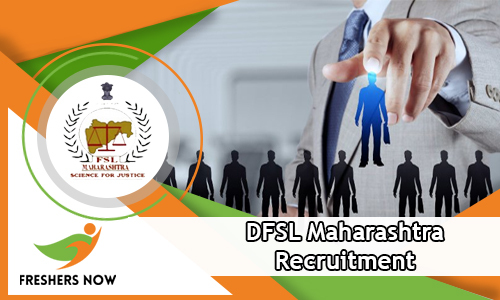 Now, the officials are going to accept the applications for the DFSL Maharashtra Recruitment 2018-2019, only if the applicants are having both the correct age and Educational Qualification. Next information that comes in the list is salary. Now, the officials of the Directorate of Forensic Science Laboratories Maharashtra, clearly mentioned that they are going to pay good pay scale for the selected people. Accordingly, all the hired people are going to receive the amount as per the terms of the organization. So, please go ahead and check the DFSL Maharashtra Recruitment 2018-2019 Notification for post-wise Salary information. Coming to another info given in the advertisement. That is the application fee. Now, paying the application fee correctly is very important. Only those application forms that will submit before the final date by paying the application fee are considered. So, keep that in view. According to data, all the people from the General Category have to pay Rs.500/-. While the people from the Reserved Category need to pay Rs.250/- as the Application Fee. Please consider in checking the official DFSL Maharashtra Recruitment 2018-2019 Notification or the official site before making the payment. Now, after submitting the application form before or on the final date, you all have to participate in the recruitment Rounds. Basing on the information from the DFSL Maharashtra Recruitment 2018-2019 Notification, the officials of the Directorate of Forensic Science Laboratories Maharashtra are looking to hire the eligible, people by conducting the Hiring rounds. And those people who will show merit in those rounds are going to be hired. Basing on the information in the DFSL Maharashtra Recruitment 2018-2019 Notification, all the people have to pass the Written Examination along with the personal interview. You can go to the next rounds of the Recruitment Rounds, only if you clear the initial rounds. So, based on this criteria, try to prepare as soon as applying. On our site Freshersnow.com check the Preparation materials, to perform well in the Exam. Initially, check the official site of the Directorate of Forensic Science Laboratories Maharashtra at mahapariksha.gov.in. Read the requirements mentioned in the advertisement. Fill the information in the application form.